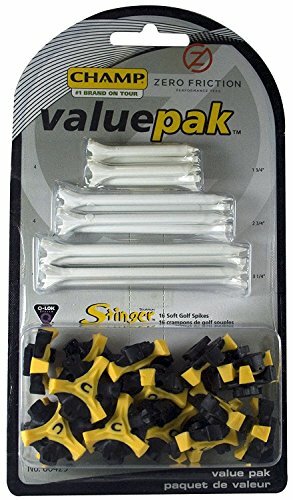 A convenient value pack that features 20 Stinger Q-Lok spikes and an assortment of Zero Friction Tees. Fits easily in your golf bag. World's best spike. Includes 20 Stinger Q-Lok spikes and assorted Zero Friction tees. Refer to Champ Fitting Guide at http://www.champspikes.com/images/08SpikeGuide.pdf.